Authors in antiquity taught that bee colonies were governed by a king. Today we know that in each colony there is a queen, or better, a mother, for, this mother is only a full female, fertilised and capable of assuring the future of her family through her laying. The overall ruler of the colony is the common interest. We shall however conform to common usage by calling the colony's mother 'queen'. There is normally only one queen in a colony. Sometimes, however, we have seen two queens in a colony. Other beekeepers report having seen three. These exceptions happen for several reasons. A queen that is too old does not have sufficient energy to go and kill her daughter at birth, as earlier in her life her instinct would have driven her to do. Or possibly the beekeeper has introduced successively several queens to a colony he believed to be queenless. The queens have been kept separate, pushed by the bees in opposite directions. In fact they have formed different groups in the colony, each having the elements of one colony. This state disappears as soon as the groups become closer together, be it through the growth of the two groups, or through the arrival of cold weather. The disorder created by the departure of a secondary swarm favours for a while the presence of several hatched queens at the same time. When two queens meet, they attack one another. The strongest or the most able pierces the abdomen of the weaker one with its sting. Death is the result. Sometimes two queens sting each other, as happens to two duellists, and kill each other. This antipathy exists between all mated queens, virgins, or even queens still enclosed in their cell. When the bees raise queens for whatever reason, they make several queen cells, ten to fifteen. Now the queen that first hatches hurries to find the cells where her sisters are preparing to hatch, and pierces them with her sting. I observe here a means of rigorous selection given by nature to the bee. Only one queen is saved out of ten or fifteen. For this queen is the one who was the first to lift the cover of her cell; she is the most vigorous. During visits to hives one frequently sees very tight clumps of bees. If one separates them by force, or by heavy smoking, one finds a queen in the middle. Such a queen is said to be balled. This embrace of the bees is caused by joy or antipathy. When a beekeeper has kept a queen separated from her colony for too long, when he has not enabled a queen to leave her introduction cage quickly enough, or when there is robbing and danger for the queen, the bees in their excessive excitement press themselves round the queen as hard as they can, squeezing her, clasping her and suffocating her. At other times this is caused by antipathy; it is accompanied by stings and a rapid death follows. This happens to old infertile queens, shortly after the hatching of their successor; to queens that the beekeeper has kept too long between his fingers or hands, thus changing the particular scent that enables the workers to recognise her; and to young queens who on returning from mating, enter a foreign hive that is too near their own. Consequences of the disappearance of the queen A colony deprived of its queen is described as queenless. If the queen disappears and is not replaced by the beekeeper or the bees, the population of the colony diminishes rapidly until it disappears. Her presence is necessary because only the queen lays the eggs destined for perpetuating the family. Nature too has taken all possible measures to keep her alive. The queen is mated in the air during flight. These circumstances make this act dangerous for an insect as fragile as a bee. It is also unique. The queen bee meets the male only once in her life. And subsequently never leaves her combs unless in the midst of a swarm that is leaving to start a new home. doubtless because the queen is stronger and more robust, but also because the bees save for her the last mouthful of honey. 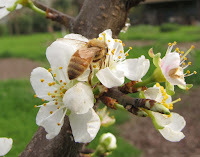 The queen does not possess wax secreting organs nor the equipment for gathering pollen or honey. The queen does not even know how to feed herself. If she is enclosed alone in a box with some honey within reach she will die of hunger beside the honey.It seems to be the same in the hive. While she is laying, the workers supply the queen with brood food, a mixture of honey and pollen already modified by an initial digestion; and when she is not laying, pure honey. However, according to Dr. Miller, it is not the worker that passes the food into the mouth of its mother, because the discharge of the food is only possible with the tongue retracted. On the contrary, it is the queen who introduces her tongue into the mouth of the worker to take into her crop the brood food that is already prepared for her. The queen is shy and retiring. The slightest unusual noise frightens her. She often hides herself in the recesses of the hive where one might crush her, or at least have difficulty finding her. The queen does not even use her sting except against young queens. The queen's appearance makes it easy to find her. She is fatter and much longer than a worker. Her abdomen, of a lighter shade, extends well beyond her wings. Her deportment is more stately. She is distinguished equally from the male by her more slender body. The male has a much more rounded and hairier end to his abdomen. His wings are longer than his abdomen. midday. Certainty that the queen is present Even without having seen her, one can be certain that the queen is in a nest if there is larval worker-brood, and better still if there are newly laid eggs and if the bees are coming and going, bringing pollen as they return. It is said that the queen has a strong odour, smelling like melissa, particularly as the bees of the colony more or less take it on.